Bay tobiano colt born June 2016. 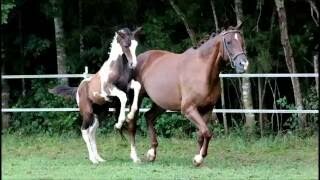 By Pallido Blu CF and out of BWP Select mare Fascination ES. Bold personality with a friendly outgoing demeanor. Excellent conformation with uphill movement. Fantastic opportunity to purchase a colt that will get you noticed in the show ring, at a reasonable price. Paladin EMP was presented to RPSI for registration, branding and microchipping where he received a Premium award.